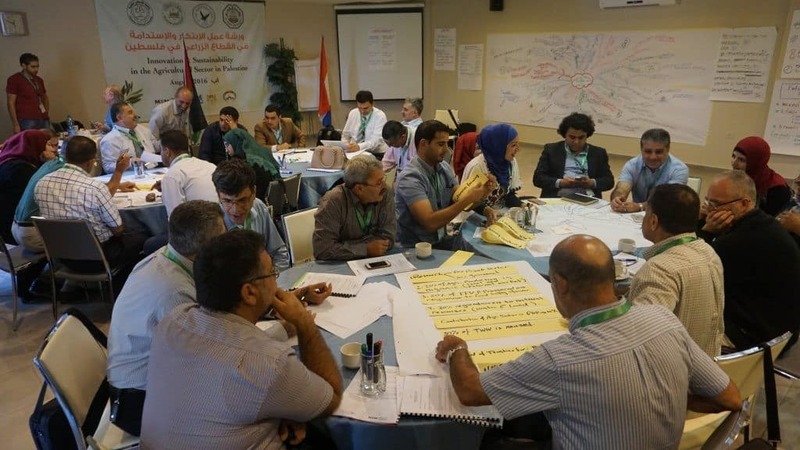 On 1 September, around 80 key stakeholders of the Palestinian agricultural sector agreed on a common ground for change towards a more innovative and sustained agricultural sector in Palestine. They had been working together during a three days interactive Future Search workshop in Jericho on the initiative of MSM. In the closing session, the Minister of Agriculture, Dr Sufian Sultan and the Minister of Education and Higher Education, Dr Sabri Saidam, expressed their support and congratulations for this success, and welcomed the innovative, participatory, collaborative approach. The workshop was part of the Netherlands-funded ‘Palestinian Academic – Agribusiness Cooperation’ (PAAC) project, aiming to expand and deepen the academic resource base of Palestinian universities, innovating their educational operations, expanding their linkages to the public and private sector and strengthening their management and governance. The universities are Al-Quds University, An-Najah National University, Palestine Technical University Khadoori, and Hebron University, represented at the Jericho-workshop on president level. The project is implemented by a consortium led by MSM. The question at the table was how to strengthen the agricultural sector for the benefit of the economy, and also ensuring that the Palestinian people have access to sufficient, safe and nutritious food. How to innovate and sustain the agricultural sector, what is needed by whom, and in togetherness? In togetherness, students, university managers, teachers, business people, donors, NGOs, and researchers came up with eight thematic areas for action and committed to carry these forward. These areas are: market oriented education and training, export-oriented production, technology development, marketing, research, legal and policy regulations, and certification. In addition, the participants agreed on a coordination and follow-up mechanism ensuring that coherent action indeed will be taken. During the three days, facilitated by Mr Han Rakels of Perspectivity and Mr Huub Mudde, MSM, all participants were active at every phase of the future search in a series of structured dialogues. The non-traditional approach with mind-mapping, interactive work formats, and absence of keynote speakers was at first confusing for the participants, but at the end highly appreciated and seen as an example for what is needed to strengthen collaboration in the country. The Minister of Agriculture came to visit each day expressing his commitment and sincere interest.